Club Penguin Cheats by Mimo777 Club Penguin Cheats by Mimo777: Herbert Wants To DEFEAT the EPF! So, Herbert isn't REALLY on our side, he just doesn't want us destroyed! Hmmm, very interesting, don't you think? I think that really, he is beginning to like us. Maybe he'll end up joining us? It's still possible. I think he's seen how much fun we have all the time, and want to join in! What's really the difference between destroy and defeat? If you just "defeat" us, then we'll just come back. Is herbert really that dumb? Mabey he just wants to get back at us and then leave us alone? for: That's right, you mechanical menace! I should never have rebuilt you! I want to DEFEAT the Elite Penguin Fools, not destroy them! its NOT phunny! Have you ever notitced when Herbet calls us names the first letters spell out EPF?! Ah, ha! I knew something was fishy ever since we got the message about the presciption. I`m shocked! For once I really did think that he was on our side after he told us about the Protobot. I wonder what he will do now? then why did he DESTROY the psa??? I Think Protobot Suggested That They Should Dystroy Us For Good... Herbet Just Wants To Win Once. I Mean, We Dystroyed His Dreams How Many Times? We Just Need To Give Him What He Wants. To Go Someplace Warm. I think he is just saying that so that robot wont suspect a thing! now that's weird. But didn't he say he only wanted to take over club penguin when we first met him? and if he's really on our side does he have to call us fools? wait... isnt defeating and destorying the same thing? 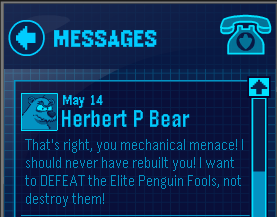 or does herbert just wanna epf to back off? No he is still on our side, you just misunderstood the message. He is on our side, but protobot wants to destroy us and herbert doesn't so he is still on our side just still our enemy. We are allies until protobot is gone, then we will be enemies once more. Well if it I were in charge, I'd have Herbert destroyed, so I guess you're lucky I'm not in charge. Tsk tsk tsk. Herbert is probably just using us to get rid of ol' Protobot then he'll turn his furry polar bear back on us! Yeah, do you really think clubpenguin wants to teach kids violence. Come on, CP works for disney. A kids network! I hope that he wont join us, but instead get on our side and then we'll send him to an island w/ klutzy and they'll be happy together. do you think that maybe rockhopper will take him to rockhopper island? i also noticed someone mentioned that he said to defeat and not destroy,when only destroying us would really defeat us.they mentioned it could be a trap to protobot. I guess he might malfunction with confusing things, like some robots do-i.e.,the sentence after this is a lie. the sentence before this is true.- whada you think mimo?